The holiday season kicks off at Disney California Adventure® Park with the debut of Festival of Holidays on Nov. 10, 2016. You are invited to come celebrate heartwarming holiday festivities inspired by cultural traditions from around the world. You’ll create new memories as you share in delicious food and drink, fun craft making and the universal language of music and dance. Wonderful entertainment experiences throughout the park draw on the diverse celebrations that bring joy during this festive time of year, including Diwali, Hanukkah, Kwanzaa, Christmas/Navidad and Three Kings Day. Disney ¡Viva Navidad! – You can enjoy holiday foods, crafts, Disney Character greetings and Latin American bands. 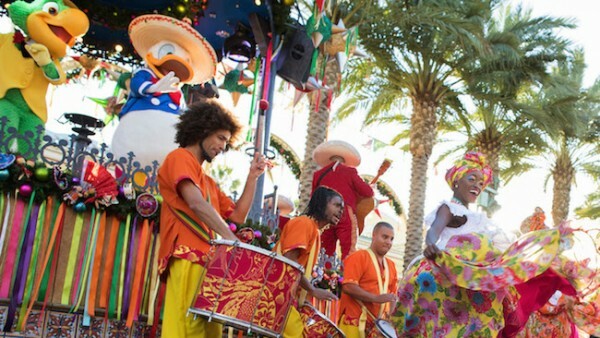 Plus, The Three Caballeros host a fun street party featuring folklórico and samba dancers, live musicians and Mickey and Minnie in their fiesta best! Princess Elena’s Musical Grand Arrival – Elena of Avalor makes her Disneyland®Resort debut during Festival of Holidays! You can welcome the adventurous and kind-hearted Crown Princess, her royal dancers and magical friend Skylar as they celebrate the holidays with an uplifting musical cavalcade. All this, plus an array of Disney Character experiences and kid-friendly activities! During Festival of Holidays at Disney California Adventure Park, you can stop by Redwood Creek Challenge Trail for Santa’s Holiday Visit, where you’ll meet Santa and see how his joyful elves have transformed the area into a jolly playground of holiday fun and games. As the sun sets, you won’t want to miss the evening concert at Paradise Park, featuring performances from two of the festival’s musical groups. And, a day of celebrating the season wouldn’t be complete without experiencing the all-new, nighttime water and light spectacular, “World of Color – Season of Light,” combining classic holiday songs with beloved characters and heartwarming moments from Disney and Pixar animation to create a sparkling winter fantasy filled with magic! Festival of Holidays kicks off Nov. 10, 2016 at Disney California Adventure Park and continues daily through Jan. 8, 2017. This entry was posted on November 5, 2016 at 11:22 am and is filed under Disney News, Disneyland, Special Events. You can follow any responses to this entry through the RSS 2.0 feed. You can leave a response or trackback from your own site.